Custom built storage buildings can be anything you need & want! Some companies build nothing but "cookie cutter buildings" that all look the same and offer no options. Where is the fun in that? At Lanco, you are the boss! We want to build products that you like and that meet your needs. That's why we offer so many options. From siding choices, paint colors, door types, window types and placement, metal roof or shingles, flower boxes, cupolas, it's all your call! But if those options still aren't what you are looking for, give us a call. 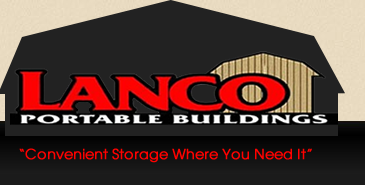 We are ready and excited to meet with you and discuss plans for your custom Lanco Building! We believe in Quality Construction. All exterior lumber is pressure treated. Exposed nails are galvanized to prevent rust and staining. Our floors are 3/4" Treated Plywood. Several basic colors are kept in stock or you may specify a specific color to match your existing structures. Disclaimer: colors may not match exactly to displayed swatch due to technology variations.